David Chandler is a penname of horror author David Wellington who was born in Pittsburgh, Pennsylvania, where George Romero shot his classic zombie films. He attended Syracuse University and Penn State and is working towards a degree in Library Science at the Pratt Institute. Mr. Wellington is most famous for his free online serialized zombie and vampire novels. He lives in New York City with his wife. Read some of his work at David Wellington’s website. The Ancient Blades — (2011-2012) Publisher: Born and raised in the squalid depths of the Free City of Ness, Malden became a thief by necessity. Now he must pay a fortune to join the criminal operation of Cutbill, lord of the underworld — and one does not refuse the master… and live. The coronet of the Burgrave would fulfill Malden’s obligations, though it is guarded by hungry demons that would tear the soul from any interloper. But the desperate endeavor leads to a more terrible destiny, as Malden, an outlaw knight, and an ensorcelled lady must face the most terrifying evil in the land. FORMAT/INFO: Den of Thieves is 480 pages long divided over a Prologue, four titled Parts, and 100 chapters. The book also includes a map of the Free City of Ness and an excerpt from A Thief in the Night, book two of The Ancient Blades trilogy. Narration is in the third person, mostly via the thief Malden and the knight Sir Croy, while minor POVs include Cythera. 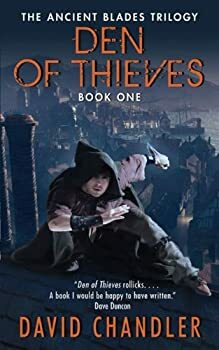 Den of Thieves is self-contained, but is the first volume in The Ancient Blades trilogy, which will be followed by A Thief in the Night in September 2011 and Honor Among Thieves in November 2011.